Did you know The River Cafe Restaurant is owned and operated by Ruth Rogers and until her death last year Rose Gray? The Restaurant is a old oil storage facility that Lord Rogers, an architect and the husband of Ruth Rodgers modified. It is located on the Thames in London and has been criticized for its pricey menu. These two women are Gourmet Magazines game changer #26. The River Cafe Restaurant is an Italian style eatery known for its open floor plan and simple cooking. Along with their successful restaurant, Rose and Gray have six cookbooks under their belt. I decided to make their Roast Potatoes. Here are some fellow bloggers who also featured Ruth Rodgers and Rose Gray. Taryn – Have Kitchen Will Feed, Susan – The Spice Garden Claudia – A Seasonal Cook in Turkey, Heather – girlichef Miranda – Mangoes and Chutney, Jeanette – Healthy Living April – Abby Sweets, Katie – Making Michael Pollan Proud Mary – One Perfect Bite, Kathleen – Bake Away with Me Viola – The Life is Good Kitchen, Sue – The View from Great Island Barbara – Movable Feasts, Kathleen – Gonna Want Seconds Amy – Beloved Green,Jeanette – Healthy Living Linda – Ciao Chow Linda, Linda A – There and Back Again Martha – Lines from Linderhof, Nancy – Picadillo Mireya – My Healthy Eating Habits, Veronica – My Catholic Kitchen Annie – Most Lovely Things Please join us next Friday when we feature Anne Willian. I love the look of the different potatoes thrown together like that. It’s elegant and rustic at the same time. And, is there anything better than potatoes roasted with rosemary? Well, than potatoes? 🙂 Hope you’re well! I’m such a fan of these beautiful little colored potatoes. This is the prefect side dish for so many lackluster winter dinners. You present them so elegantly! 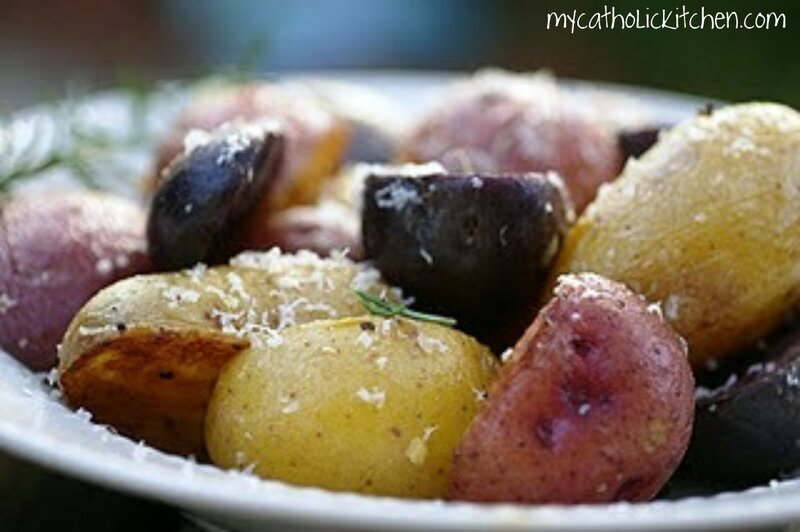 The best, most classic way to roast a potato – I could have these every day. But they never look as lovely as your photos! What a nice idea to use different colored potatoes. It sure looks like something you’d want to eat. Those potatoes looks so festive…what a delicious looking dish! These little gems certainly do exemplify what their cooking philosphy is all about. 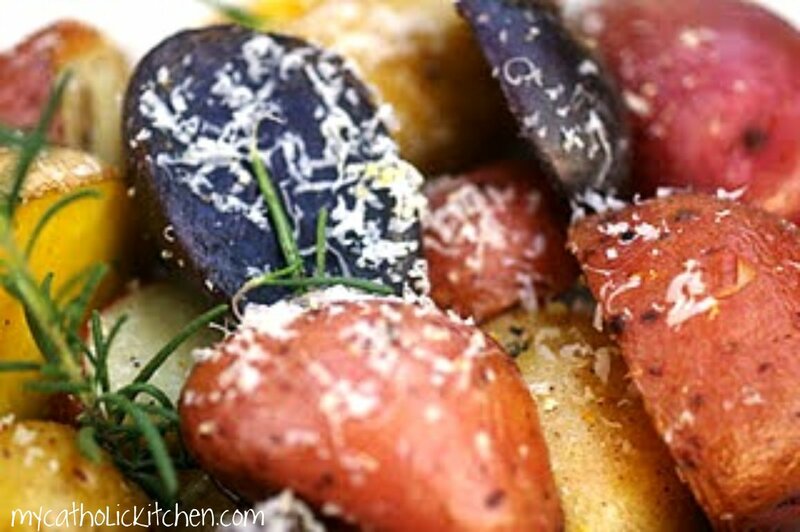 Roasted potatoes are one of my favorite side dishes – I love the way you’ve presented them.